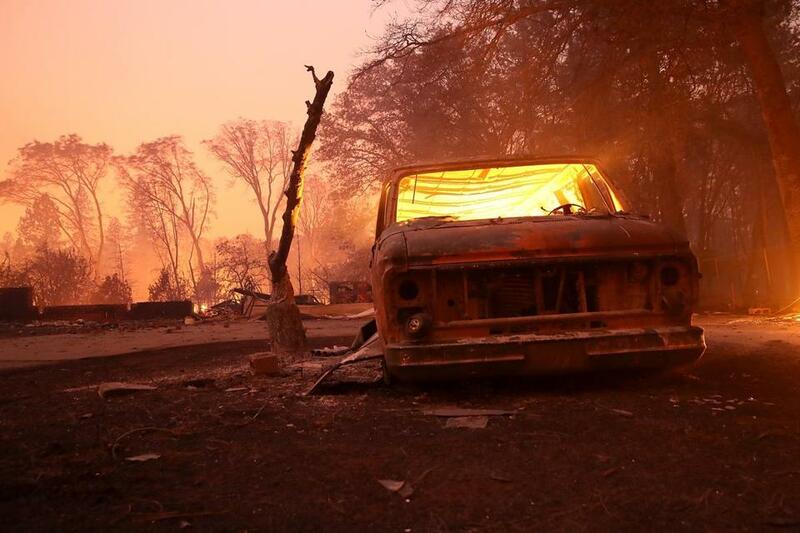 A burned-out van smoldered in Paradise, Calif., after a wildfire being called ‘Camp Fire’ moved through the area. ‘‘Pretty much the community of Paradise is destroyed, it’s that kind of devastation,’’ said Cal Fire Capt. Scott McLean late Thursday. He estimated that a couple of thousand structures were destroyed in the town about 180 miles (290 kilometers) northeast of San Francisco. 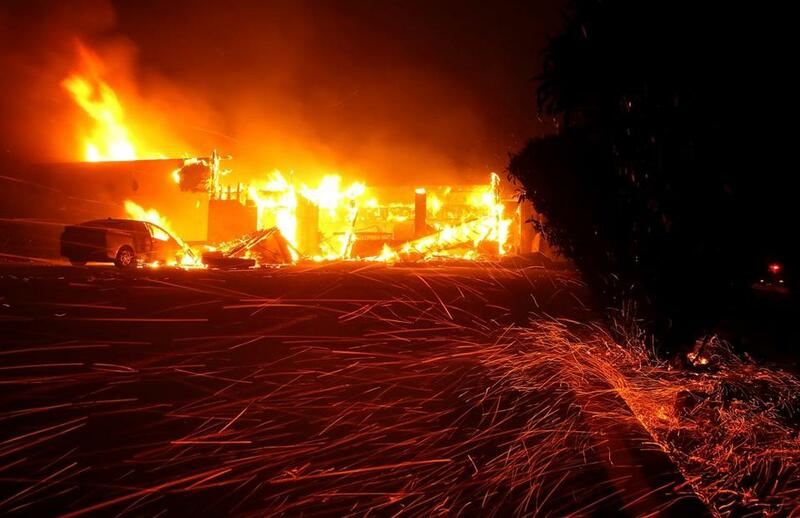 Embers blow in the wind in Paradise, California, as the Camp Fire burns a KFC restaurant. The fire was reported shortly after daybreak in a rural area. By nightfall, it had consumed more than 28 square miles and firefighters had no containment on the blaze, McLean said. ‘‘It’s a very dangerous and very serious situation,’’ Butte County Sheriff Kory Honea said. ‘‘We’re working very hard to get people out. The message I want to get out is: If you can evacuate, you need to evacuate.’’ Several evacuation centers were set up in nearby towns. 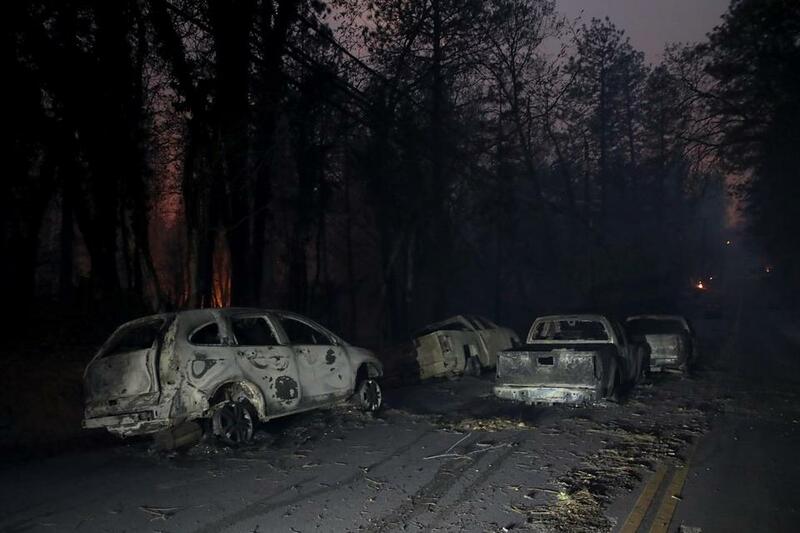 Abandoned cars in Paradise, Calif., after a fire moved through the area. ‘‘It was absolutely dark,’’ said resident Mike Molloy, who said he made a split decision based on the wind to leave Thursday morning, packing only the minimum and joining a sea of other vehicles. 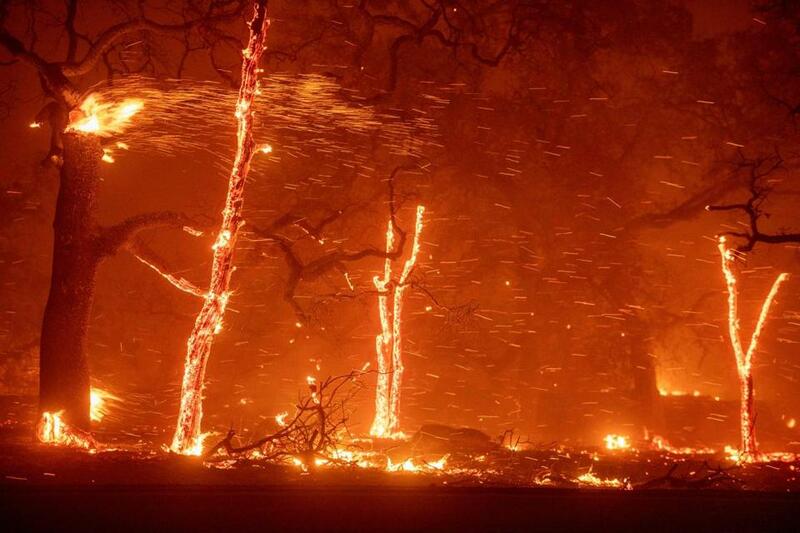 Trees burned in Paradise, California.